Applying foundation; setting concealer; blending contouring lines. This is a sponge, usually in different shapes and sizes depending on its purpose. This sponge is perfect for blending in any foundation, concealer, creamy contouring color or even creamy blush. Wet the sponge under running water until it enlarges a bit which will prevent it from absorbing your beauty product instead. Then with slight tapping movements blend all the different shades you’re using very nicely so you get this natural finished look. Remember to use it before applying any powder products! This is the ultimate standard brush. It is designed to help you get a smooth and finished look as the bristles are tightly packed, short and soft for a great application. The foundation brush, as well as the concealer one, has to be synthetic so that it makes the application process easier and more effective. Foundation is the base of your face, and therefore, this brush is really important. You don’t really want to look like you haven’t slept for days, do you? That is why you have to be careful how you apply your foundation. Fingers are not really the best way to apply your foundation since your skin will absorb a big amount of the foundation and you will end up using much more than it actually is needed. Also, using your hands is the best way to transfer all the bacteria from your hands right onto your face. And you don’t really want to do that, right? That’s when the foundation brush comes to the rescue! The concealer brush is quite small but also thick and flexible as a texture so that you have better control over your movements and better precision. Its shape makes it easy to reach also the corners of your eyes or just cover really small spots more precisely. Concealer is another important part of your daily makeup routine. But applying it the right way and blending it nicely with your foundation is the tricky part which most women struggle with. That is why it is much easier and more effective to use the concealer brush instead of your hands or even a sponge. Concealer is extremely important, not just as a part of the contouring makeup technique that everyone is obsessing over recently, but also as a solution to your tired and puffy eyes, dark circles or breakouts. The right time to apply the concealer is right after the foundation so that you get this nice blend of natural shades. Don’t forget to pick a color which is one shade lighter than your skin color so that I stick to the natural face look. The powder brush is usually made of natural bristles or it’s duo fiber. The duo fiber brushes are a combination of both natural animal bristles and white synthetic ends. These brushes are perfect for applying powder products such as a face powder or bronzer because they are light and airy which gives you more freedom and better spread of the product. The powder brush is not a must, especially if you don’t really use any powder in your makeup routine. However, if you want to give your face this nice bit of a matte effect (mostly on the T-zone), then this is the right brush to use. Tap your brush onto the powder product to make sure you don’t grab too much of the product and apply it with light and free movements. Remember not to press too hard onto your skin so that you don’t put yet another layer of makeup on your face. The powder is just a finishing touch to the base of your makeup so that you get rid of the natural glow in the T-zone. This kind of brush is also suitable for applying blush. However, if you want to have more emphasized cheeks, then it’s better to use the angled face brush. The Angled face brush is ideal for applying blush or bronzer. The bristles of this brush are also tightly packed, same as the foundation brush so that you can spread the product more precisely on the cheeks. Moreover, the bristles are cut in a slight angle, which makes the brush perfect for following the forms of your face when applying either a blush or a bronzer for contouring. If you want to emphasize more on your cheeks or do some slight contouring of your face, this is the ideal brush to do so. The specific triangular shape of the brush allows you to follow the forms of your face and apply just enough product on the right spots which you would like to put the focus on. Same as the powder brush, tap on the bronzer or blush to collect some product and apply on the areas you want with strokes while using a bit of pressure. If you prefer building up on your blush or contour shades or you just feel that the product you collected with the brush is a bit too much, tap the stick of your brush onto your hand in order to evenly release the bristles of the extra powder. This will give you light and smooth shades that you can later build upon in order to reach the wanted effect. However, if you’re using a cream blush stick, the best way to apply it is still with your fingers or using the beauty blender sponge. This is one of the most interesting shaped-brush. It literally looks like an open fan. It is light and fairy, with long spread bristles that allow you to have freedom of spreading a bit of shimmer or highlight on your cheekbones, the tip of your nose and also on your upper lip for more emphasis. A highlighter is important as adding a bit of a natural glow to your skin. The fan-shaped brush is ideal for spreading a bit of shimmer to brighten up your face. However, be careful not to apply too much product on your face because you definitely don’t want to be beaming like the moon. :D That is when this brush comes to a very good use because it allows you to put a light layer of just the right amount of product that does the job. Slightly run the tips of the bristles through the product (if it’s pressed powder) and with free, fairy stroke movements apply it on your cheekbones, the tip of your nose and maybe on the tips of your upper lip to make your lips pop. If you’re using a creamy or liquid highlighter, the best way to apply it is with slight taps with your fingers or using the beauty blender sponge to blend it nicely with your makeup base. This is a small brush with relatively short bristles which are a bit more tightly packed so that it makes the eyeshadow application easier. It is ideal for applying powder to creamy eyeshadows on your eyelid, as well as smudging some darker colors into your crease for a more smokey look. To apply eyeshadow on your lid, just collect a bit of the product with the tips of the bristles and make sure that you blend it evenly on your whole eyelid. If you want to add a bit of a smokey look, using the same brush, you can apply some darker colors into your crease with slight circular movements in the outer corner of your eye and slight strokes following the curve of your crease. This will create a slight shadow over your eyelid which will make your eyes pop. This is comparatively small in size brush with relatively short bristles. It is perfect for smudging colors or darker shades for your lower lash line. And because it is small, it gives you the precision needed. It is a great solution if you want to emphasize your eyes and make the pop. It allows you to do make details because it gives you a bit more precision. Collect some product with the tips of the bristles and apply the product on the area you want. Since it is really precise, you can use a bit of pressure when applying the color to emphasize the area even more. The eye liner brush is maybe the smallest of all brushes. It is meant to be really precise because you have to be able to make perfect lines with it. It is more of a pen-shaped brush. If you like to use a powdered eye shadow or creamy, gel-like color to do your eyeliner, then this is a brush you do really need. In case you are using a pencil eyeliner, you don’t really need to have this kind of brush. Collect some color with the tips of the bristles and do a thin line following the line of your eyelashes. If you want to do a winged eyeliner look, then you have to do another thin line starting from the outer corner of your lower eyelashes and draw it up until it intersects with the first line you made following your upper eyelashes. This brush is tiny and has short angle-cut bristles. This allows you to do more precise strokes. This brush is not a must, especially if you’re using a brow pencil, but it is really convenient when it comes to applying powdered or creamy, gel-like brow color. Slightly run the tips of the brush through the product and start applying it on your brows to shape them nicely. Always do small strokes that follow your hair growth so that your brows actually look natural in the end. This brush is usually really tiny. It has relatively short and flexible bristles. It has more of a pencil shape which allows you to have better control over your movements when applying the lipstick. The lip brush is great for applying dark lipsticks or just vibrant ones because with the intense colors it is very important to have perfect lip lines. Also, if you don’t feel confident enough applying the lipstick directly, this is the best solution. It allows you to be more precise when contouring your lips. Slightly run the tips of the bristles through the lipstick to collect some color and carefully apply it on your lips. You can also use it to blend a slight layer of lip gloss with your lipstick to give a bit of beautiful glow of your lips. PS. I’ve found the ultimate video guide to makeup brushes which I think is awesome so I’ve also used some shots to introduce my brush picks. Tips- How to clean up brushes? All you need is a glass jar, hot water, 1 tbsp dish soap, and 1 tbsp of distilled white vinegar. Mix it and put the brushes to sit for 20 min. Then rinse them with warm water and let them dry overnight. If you have bigger brushes brush the makeup brush with a comb on the running water to get rid of any dried makeup in the middle. Leave it to dry overnight. Beauty blender hack- how to clean it?! You just need a bar of soap. Put the sponge under water until it enlarges and then run the sponge on the soap from all sides under running water. That’s how it cleanses the sponge from the inside out because throughout the rubbing the sponge absorbs the soap. But which makeup brands to search for? Here are the types of brushes I use along with their brands and prices. 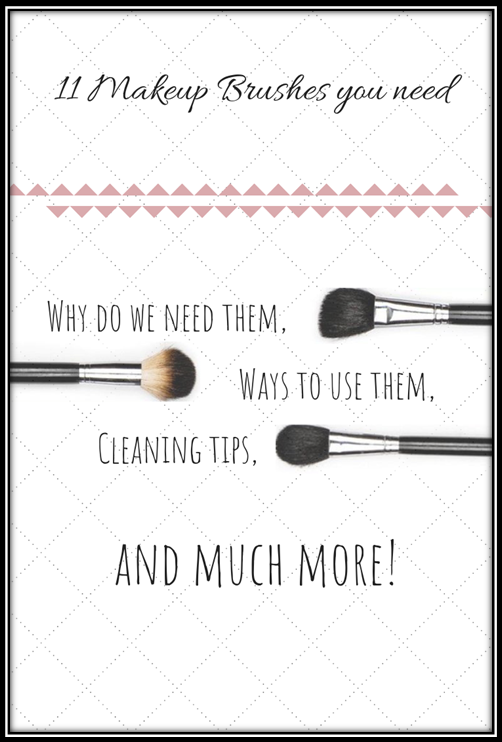 As I mentioned in the beginning, there are so many kinds of makeup brushes out there so you just have to make sure to find the right ones for you. I hope this list of basic makeup brushes was as enlightening for you ladies as it was for me! Feel free to share your thoughts and experience.